If you have a cherished acoustic guitar that you want to play live, then at some point you are probably going to need to amplify it. There are really only three choices when you amplify acoustic guitars to get the right sound and all of them are a compromise. 1. You can mic it up and feed the signal through a PA.
2. You can use under-saddle Piezo pickups. 3. 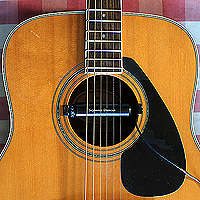 You can use a magnetic pick up in the sound hole. If you mic it well and have a good understanding of PA systems this option can sound great, but you have to balance it against feedback problems and being tied to a microphone stand. If you decide to use under-saddle Piezo pickups you have to contend with the sound of the guitar changing its tone when amplified. Piezo pickups rely on the vibration through the saddle of the guitar and because the output is so small you need to add a preamp to get enough signal to drive the amp. Another problem with this method is that unless you buy a guitar with pickups already fitted, you will have to make a mod to your favourite acoustic guitar. 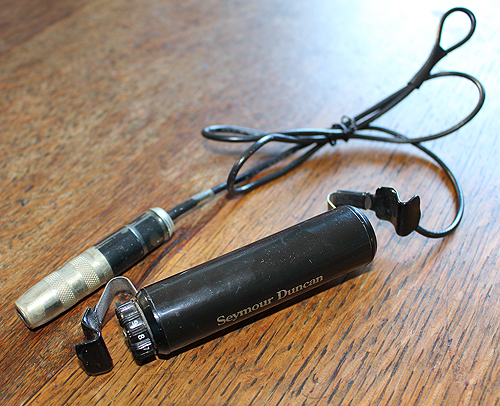 This could radically change the sound of your guitar if it’s not done properly. If you use a magnetic pick up there is no modification needed as they just clip on to the sound hole and can be removed just as easily. They wont need any work done on your guitar and they generally don't feed back. As with the other options the balance here is between adapting your sound and ease of use. The pick up option is by far the simplest and easiest. 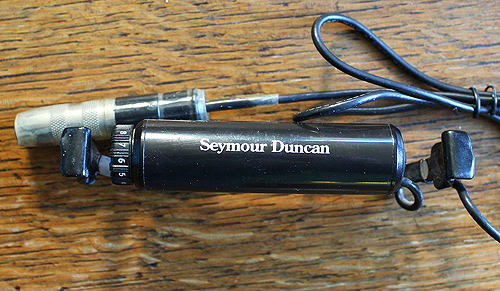 The pick up being advertised here is the Seymour Duncan SA1 acoustic tube pick up. 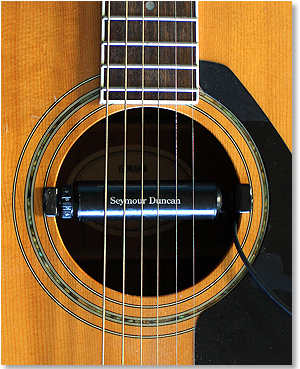 The Acoustic Tube SA-1 is a simple passive magnetic sound hole pickup based on the hum-cancelling Stack® technology found in many Seymour Duncan single coil pickups for electric guitar. It’s housed in a lipstick-style casing with flexible mounting brackets either side which will fit any conventional acoustic guitar with a soundhole between 3.85″ and 4.10″, from parlor and auditorium to jumbo and dreadnought. And it can pop out just as easily should you wish to return your guitar to its original state or use the SA-1 in a different guitar. There’s a volume control mounted to one end of the enclosure, and connection to your amp, PA, direct box or console is made by plugging any standard guitar cable into the female 1/4″ output jack. And it can pop out just as easily should you wish to return your guitar to its original state or use the SA-1 in a different guitar. It is much easier to fit this pick up without strings on but with some double digit dexterity you change it between guitars with the strings on. Because the SA-1 is magnetic, it interacts with your guitar’s vibrational characteristics in the same kind of way that regular magnetic pickups for electric guitars do, with plenty of warmth and detail. And it’s completely passive, so no batteries are required. If you choose to use a pick up for acoustic performance then this is the simplest solution to playing that requires no guitar mods or microphones.